Don’t let the picture above fool you. It looks weird and kinda brown and shiny – like some kind of magical dragon shed its tasty skin in my bowl – but that right there, is a bowl full of awesome. 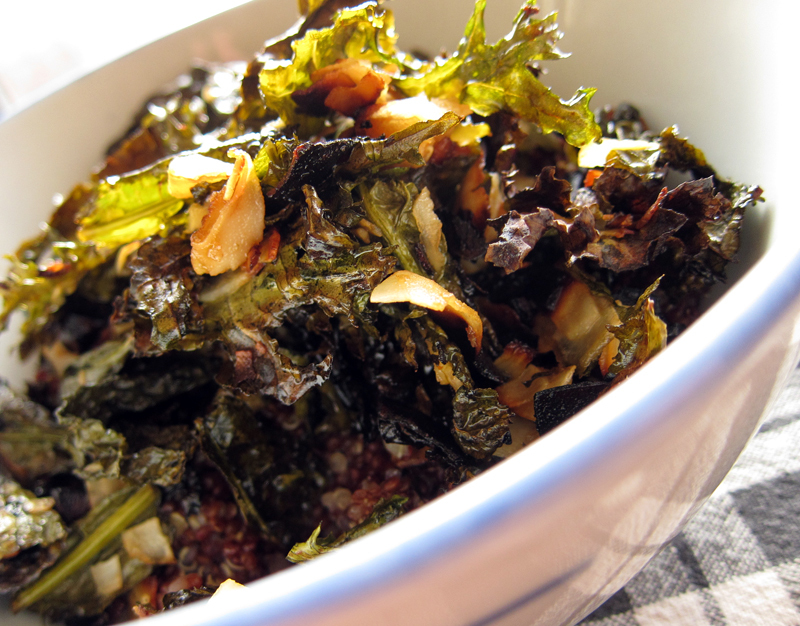 Crispy kale + garlic + coconut bathed in a sesame/soy blend and baked. Well, if the truth be known, a bit over-baked. But you know what? Still freakin’ delicious. I clamour for the stuff now. I recently picked up a whole mess of kale from the farmer’s market. The bunch I picked wasn’t just one kind of kale, but included several varieties of baby kale and I was eager to try them immediately. Unfortunately, stuff happens and that bag of baby kale sat in my fridge for a wee bit longer than I originally imagined. No worries, though. Kale is robust and hardy and there was no real damage done. And this preparation was perfect for my greens. I served this over red quinoa, which in my mind, is much better tasting than plain ol’ regular quinoa. And it’s just as delicious over millet or farro. And while this recipe is called a salad, it’s not your usual garden variety mess of greens. The orginal recipe didn’t call for garlic or hot sauce, but how could I leave them out? 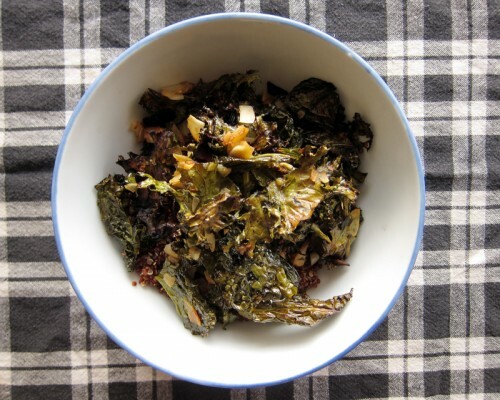 Together they meld perfectly with the kale and the coconut and the asian-y flavours. Did you pick up some coconut ribbons yet? You know, the stuff I used in those chocolate coconut squares? Well, this is a much healthier way to use up the rest of your bag. Or make this for dinner and the squares for dessert. Balance, people. elsewhere: Check out my latest post at Poppytalk where I make a very tasty lentil & potato soup. Another quick meal for your repertoire? Go get ’em, Tiger! Also, if you’re in Vancouver and want to know a bit more about writing or authors, check out the North Shore Writer’s Festival happening this weekend. I’m excited to be on a blogging panel on Saturday with other awesome local bloggers, so stop by the Welsh Hall this Saturday at 2pm and say hi! In a lidded jar, pour in the olive oil, sesame oil, soy sauce, hot sauce and garlic. Shake well. 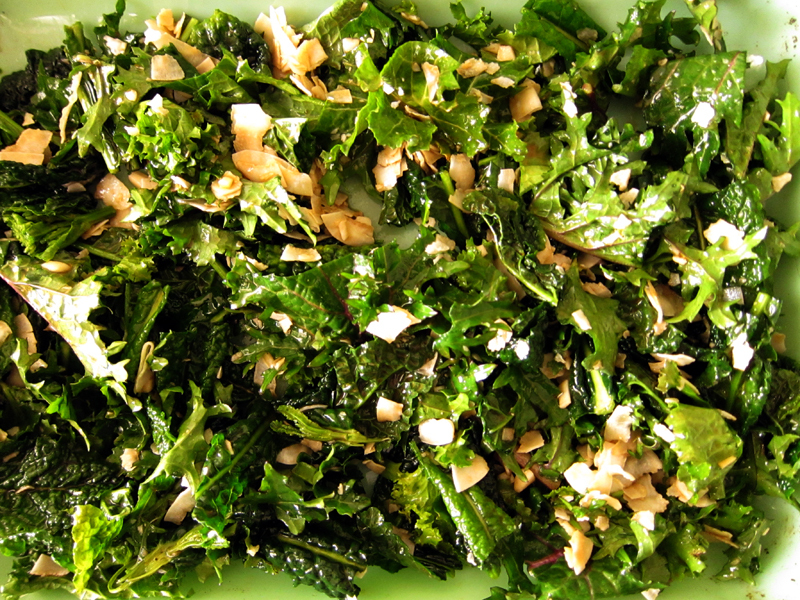 In a large bowl, dump in the chopped kale and coconut and pour in about half of the dressing. Spread out onto a large baking sheet and bake for 15 minutes or until the coconut becomes golden and the kale turns a bit crisp. Stir things about at the half-way mark. Remove from oven and serve on top of your favorite grain, drizzle with remaining dressing. Makes 2 large meal servings or 4 side dish servings. Yum! This is almost enough to get me geed up for the Australian winter. I’ve been meaning to make this from heidi’s book for a while now and given my current kale obsession, now is the time! I’ve not been too fond of kale – but some of you guys are making it look like it is ‘the’ vegetable to have – so will have to try it very soon! Another great use for those wonderful coconut chips, thank you for the inspiration! Nice work. This receipe sounds wonderful, I have everything on had to boot! Yes girl, yes! I first made this after Joy the Baker posted it, but I don’t think she attributed Heidi, so I was surprised to find it in her cookbook (Heidi Swanson’s, that is.) Joy added sriracha too and I think it’s a great addition. Anyway, this is the only way I ever want to eat kale now and may I suggest Israeli couscous as a fine chewy bed for it? I tried this recipe, too, but had to use regular shredded coconut because I’ve been having such a hard time finding ribbon coconut! I just ordered some online because I have another recipe I’m itching to try. It still was delicious, though. That Heidi really knows veggies and grains! I love your addition of garlic and hot sauce, because really, I could use both of those ingredients on almost everything. When I read your title I thought “wow, that sounds familiar..” I love Heidi’s blog and books and have been meaning to make this for a while. I just need to find a place to get those coconut ribbons. Lately I’ve been using tricolor quinoa, which has the white, red, and black (or purple) quinoa all mixed together, and I swear it tastes better than plain quinoa, too. A “magical dragon shedding its tasty skin in my bowl” has to be the most fantastically wonderful way to describe a dish of baked kale. I have that cookbook and haven’t used it nearly enough. Had I known there was a recipe full of enchantment (and also a good source of calcium) I would be using it much more frequently. First, I wish I was in Vancouver this weekend so we could meet! Second, this looks delicious. So does the picture. I know, however, that kale is a tough photo. I LOVE it, but I rarely post about it due to that. Silly, right? Have a blast at the writers’ festival! I am very familiar with the deliciousness of baked kale chips. What’s new to me is the addition of coconut to kale. Really? I would never have thought to combine the two. And somehow it works. I’ve never added hot sauce to kale but I know I will just love it. Actually, I did buy the coconut ribbons but then threw them into my triple coconut granola. I’m on a kale chip bender, so this looks like a definite must try recipe! I don’t eat kale too often, but I’ve been trying to incorporate more greens into my diet. Definitely going to try this! That looks fantastic!! Love the idea of turning crispy kale into a salad (I usually eat it right off the cookie sheet I bake it on — is that wrong?). And the addition of coconut — delicious!!! That certainly does look like a bowl full of awesome. 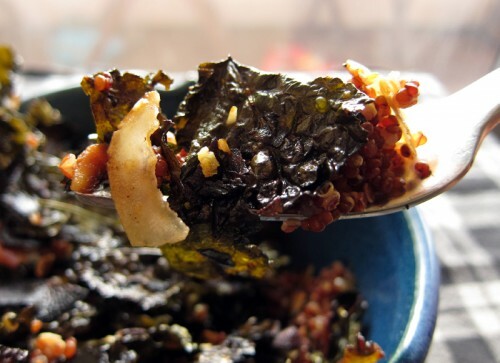 And…I have been searching for new kale recipes (love the stuff)! This is fantastic! Those brown hues did not throw me off at all – it’s kind of obvious that this is a winning partnership of flavors. Clever! Thanks so much for your comments, everyone! I’ve been eating this often and it gets better every time! I think I need to go to some twelve step program for kale… I just love the stuff. This sounds so delicious and just perfect over red quinoa. This sounds GOOD and just happens to be good for you too!! P.S. I agree that red quinoa is far superior to the regular stuff. Piper, I’m so glad you agree about the red quinoa – and being a kale lover too! I have to say, this may be my fave recipe from your site–and i use your baked goods recipes a lot. To make this a fuller meal I added smoked salmon and buckwheat noodles. Amazing. But I have made just the salad as a side about half a dozen times since you posted this! Hooray, so glad you love this one, Christine! Mmmm, love the salmon addition and the noodles – will have to give that combo a try.